With this wall I fulfilled two goals - a DGM wall and a piano wall. The process was nothing new, painting, vectoring and more fun like that. The title stands for the prelude he is playing, which is the famous Prelude in C sharp minor by Sergei Rachmaninov, IMHO one of the greatest pieces for piano ever composed. I had it in my head all the time during the walling so that makes it the source of inspiration. The hat is a credit to the composer who is often depicted wearing similar one. If you are interested, you can listen to the prelude here. This is very beautiful, I'm really enjoying the color scheme and the overall composition. You never cease to appeal me with all the gorgeous scenes you create :3. Though, there are some techincal issues that I'd love to see improved, for example, I think the outlines are too monotonous, my guess is that you're vectoring with the stroke path function, right? For things like the piano and the piano bench works fine, but for Allen and the doves...I'm not that sure. Also, I think the floating stuff in the sky shouldn't be that neat, since they're not the focal point of the wall, some blurring would create a sense of distance. 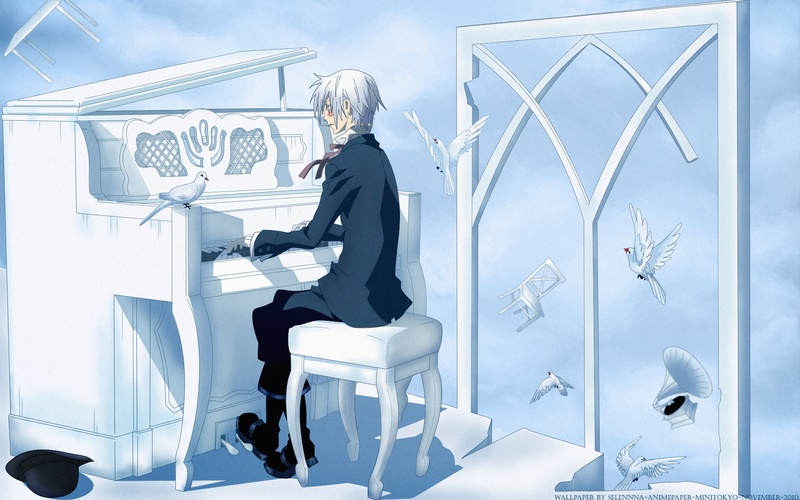 And maybe making the piano's shadow softer would be a nice touch too. I really hope you make more DGM walls 8), it definitely needs more love. Strong work here ! A very awesome wallpaper ! I think it looks absolutely perfect, great job! (^_^) I ? Allen! add a wonderfully elegant touch. The color scheme is close to the same as the scene in the anime, you even added the cloudlyness all around :3 I love the hat idea, a very put together piece. This wallpaper has one of the most important things I'm always looking for... blue color! I love the color of this wallpaper not just because I love the color blue itself but more because the colors are so bright and harmonic. That gives the wallpaper a very lively feeling from my point of view. Well, what more to say about it. The vectoring/painting is really good done. Everything fits perfect. Just one little question: From which scan are the birds? I love the birds a lot cause they work perfect with the atmosphere and they look great. Will listen later to the prelude you linked (no loudspeaker at work). I like the colour scheme you chose, really peaceful and fitting. Allen can plays the piano? Beautiful wall! It has a very serene and calming feel to it. Thanks for sharing! Really like it! Really miss the anime series though, wish they'll continue it because its getting better in the manga. :) Thanks for sharing! Changing the subject, I really like the atmosphere you created *thumbs up! Even though this is a fanart, but it is a piece of artwork that has captured and transferred the essence and feeling of the original art.